This ray box is ideal for optical demonstrations in the classroom. This Ray box is essential for all of your optical demonstrations and experiments in the physics classroom. A ventilated lamp is housed within the ray box with an open front and extended sides finned externally for heat dissipation. Four vertical internal grooves accommodate multiple slit plate and cylindrical lens positions. Takes 47 mm wide lenses, filters, and slit plates. Unit has a light source of a 12 V, 21 W lamp in a holder with one meter of twin flex with banana plugs leads. 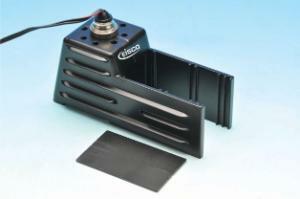 Ray box comes with single and triple slit metal plate, whitened on one side and other side black matt. Operates on 12 volt power supply, such as Labs Battery Eliminator (not included). Lens not included. Made of heavy duty die cast alloy.